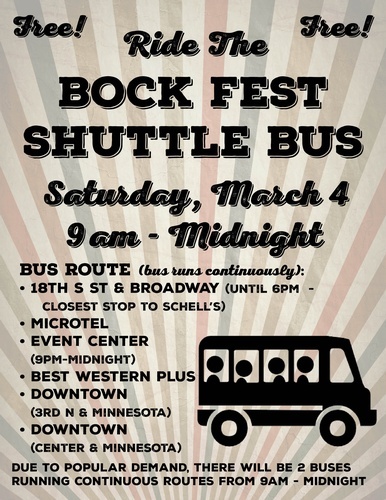 Ride the Bock Fest Shuttle Bus for Free! Schell’s Bock Fest, held March 4th this year, is one of New Ulm’s biggest festival weekends. Over 5,000 guests and visitors will arrive in New Ulm to enjoy music, food, drink and fun times. With this large number of guests coming to our town, moving them from place to place and finding parking becomes a concern. In response to this concern and to enhance our guests’ experience, the New Ulm Area Chamber of Commerce is coordinating two free shuttle buses that will transport people on a set route that includes events, establishments and lodging facilities from 9am-midnight on Saturday, March 4th. This expanded schedule and route allows festival attendees free transportation throughout New Ulm all day. For more information about Bock Fest or the Bock Fest Shuttle Bus, check out the community calendar at www.newulm.com, or contact the New Ulm Area Chamber at 507-233-4300, chamber@newulm.com.